daveha11 September 1, 2018 August 6, 2018 They promised us ... the Guardian, 2018. We could start by saying “they” didn’t promise us hoverboards. 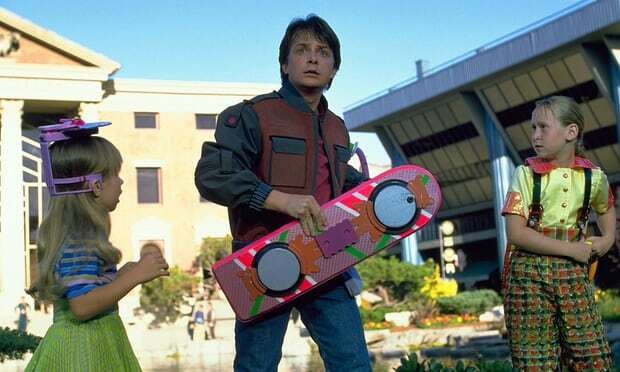 People want hoverboards because they saw one in the disappointing sequel Back to the Future (part 2). But that doesn’t mean other people shouldn’t or haven’t tried to make them. Like other colourful retrofuturist fantasies, hoverboards were a lustmotif that spoke to a whole generation like the flying car and jetpacks did to baby boomers. Problem number one: how would this thing hover? We have four choices: some type of thrust, a cushion of air, maglev or magic. If it sits on a cushion of air, it is probably a hovercraft. These have been around since the 60s. One alarming effort by Airboard originally claimed to be the genuine hoverboard, but turns out to be a personal hovercraft, looking more like an industrial floor scrubber you can ride. Essentially a floaty scooter, its noisy internal combustion engine allows it to bob about menacingly on a cushion of air, with a drive wheel on the ground to steer it. Looks fun, but it doesn’t hover, isn’t a board, and people don’t want to be seen on a giant lawnmower. If our hoverboard uses maglev – and we we do have a few examples of those – it inconveniently requires superconductors, cooled with liquid nitrogen to around minus 135C. Naturally, it also requires a magnetic surface. But they do look the part. First up, California-based company Arx Pax’s Hendo hoverboard. Watching the demo, it feels ostensibly close to that skateboard ideal – it looks a riot to ride, with whooping triallists gleefully floating about six inches above the floor. But on closer inspection, it screeches like a defective train, and is so hard to control even professional skateboarder Tony Hawk spins like a top until he is flung off. And unfortunately the battery lasts just a few minutes. And $10k a pop? Next! But what if this tech were extended to an entire skatepark, as carmaker Nexus’s Slide has done? Perhaps the closest example yet to Marty’s machine, this gadget houses a liquid nitrogen-cooled superconductor to float above a hidden magnetic track. It keeps the board in place using “quantum locking” – a property of type 2 superconductors that overcomes the habit magnets have to wobble off and repel each other, using a sort of magnetic, sticky “vortex”. Slide certainly brings us a mite closer to Marty – it looks the part, glides quietly – but there’s no getting away from the fact that, as with any maglev, it needs a special surface. It might be well hidden, but there’s still a magnetic track under that skatepark. And that won’t satiate a public hungry for Marty McFly smarts. What about conventional thrust propulsion? A US company called ArcaSpace comes admirably close to the ideal with its ArcaBoard. It’s capable of hovering a foot in the air, by dint of its 36 electric propellers, generating 200kg of lift and employing onboard balancing tech to help stabilise it – and you can control it using an app on your smartphone, which is neat. You might only be able to catch some “sweet air” on this for three minutes, but surely a great start. The drawback – ah, there’s always a drawback – is that there’s no disguising the fact that it looks like a mattress with fans on it. It hardly radiates skateboard chic, and many may balk at forking out $15 grand for a flying carpet. And there doesn’t seem to be much evidence that one can control it. What’s the point of a skateboard you can’t do sick tricks on? Then you’ve got flyboards. These are not so much floaty skateboards as flying platforms. The best known example is perhaps Frank Zapata’s jet-propelled Flyboard Air, which evolved from an earlier invention, those funky-looking water-jetpack gizmos called flyboards – you may have seen beautiful people enjoying them on YouTube. This jet-powered “personal aerial vehicle” is capable of vertical take off and landing, and can fly at a height of 150 metres at 140km/h. While it has obvious emergency and military applications, it was designed to be flown safely, sans licence, by pretty much anyone who takes a shine to it. A flight lasts 12 minutes but Zapata anticipates longer trips in future. Canadian inventor Alexander Duru’s Omni Hoverboard is a similar contrivance, which uses fans to create the requisite thrust. It’s essentially a large, rideable drone – think giant desk fan with bootstraps. Its first iteration wormed its way into the Guinness book of Records in the rather uncrowded category of longest hoverboard flight – 276m – and the firm is now working on a consumer version. A demonstration of the Flyboard Air. Both of these, like many of the drone-derived technologies now arriving on the scene, look great fun – even practical – but the nagging problem is … they aren’t skateboards. Last but definitely least, are those upright, dweeby, hands-free Segways marketed as “hoverboards” by Swegways, Airwheels and so on, now readily available at any Argos. On any given day, one might see poseurs trundling along the pavement on them, upsetting dogs. These may be fun, but the main sticking points here are that: (a) they aren’t boards and (b) they dont hover. And they have even been known to set your feet on fire. What a let-down. McFly would have spat out his cornflakes. Surely the real test of a genuine hoverboard is, can you do a sweet flipkick on it? If the answer is no, it won’t do. Back to the Future? More like back to the drawing board. Previous Flying cars: why haven’t they taken off yet? Next Ray guns: will they ever be more than cool toys?